At Dallas Limo and Black Car Service, we provide the ultimate in luxury transportation for DFW. We specialize in airport transport and we are a full service limousine company dedicated to saving our busy clients’ time with the highest standard in luxury and service. We do our best to ensure that our customers arrive at their destination refreshed and relaxed. We always go the extra mile to meet our customer expectation. For corporate or individuals, business or pleasure, our Limo and Black Car Service is the best way to get around town, to the airport, or anywhere your busy day may take you. We constantly monitor all of our customer’s flights, so you can be rest assured that whether your flight is late or early our driver will be there for you and promptly get you to your destinations. We invite you to experience our service with a passion. 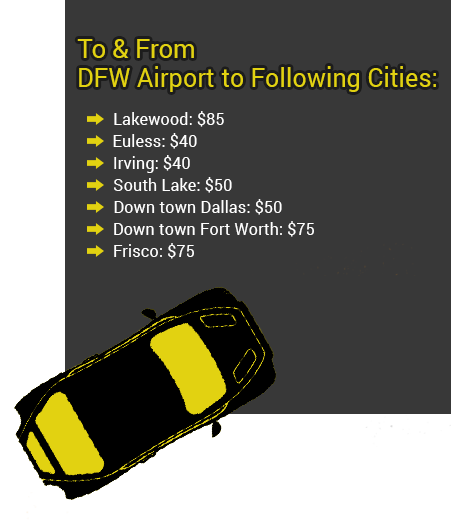 When you use Dallas Limo and Black Car Service ,you are assured of getting one fine transportation service that picks you from your home, hotel or office and drops you off at the airport, in one comfortable, reliable ride. 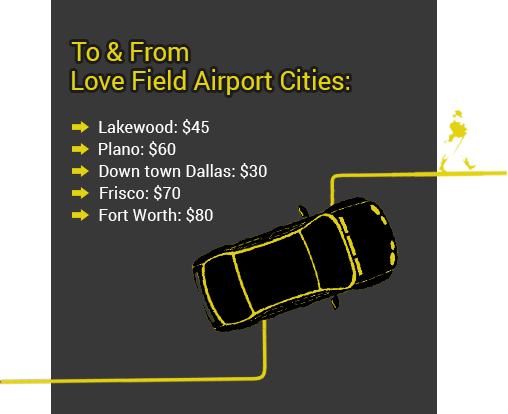 We cover all of Dallas area with DFW Airport and Love Field Airport. We specialize in corporate transpiration to and from Dallas Fort Worth International Airport (DFW), Dallas Love Field Airport (DAL), Meacham International Airport (FTW)and Grand Prairie Municipal Airport (GPM). Book Corporate Limousine Service Online. 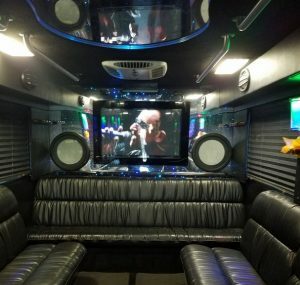 Our fleet includes new luxury SUV, stretch hummer limousines, coach & party buses, mini buses, sprinter passenger van, executive sedan, luxury sedan, Cadillac Escalade. All our cars & buses are custom built vehicles for transportation and party purposes and no two are exactly same. If multiple quantities of the same make, model and size of vehicle are available in our inventory, there will be some variations in the interior and/or exterior appointments, colors and features (versus what is shown). The maximum number of passengers as noted for each vehicle is a legal limitation. For your comfort, we recommend vehicles with a maximum capacity of 2-4 passengers more than your group size depending upon the average physical size of those in your group.